East Carolina has been one of the strongest non-Power 5 programs over the last few seasons, after winning double-digit games in 2013 and beating Virginia Tech and hanging 70 on North Carolina in back-to-back weeks last year. Oh, and in case you were wondering, that win over the Hokies came one week after Virginia Tech beat eventual national champion Ohio State. However, now this program is at a crossroads. With key losses like QB Shane Carden and WR Justin Hardy and a late season slide, will the Pirates continue to slip or right the “Black Pearl” and reclaim a spot among the Group of Five elite? 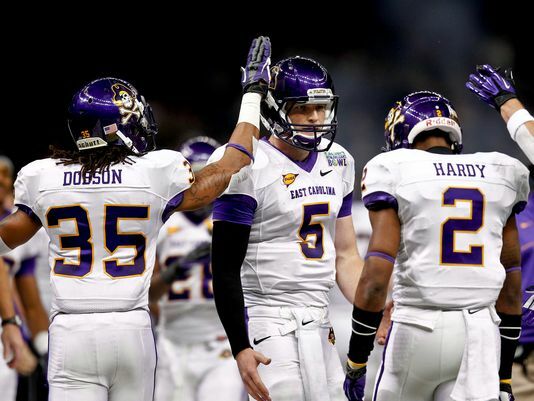 Just because the Pirates are losing Carden and Hardy, don’t expect ECU to throw less or slow down the pace. This team still has plenty of weapons and the best offensive line in the conference protecting them. J.T. Boyd and “I Like” Ike Harris were second team All-AAC selections a season ago. 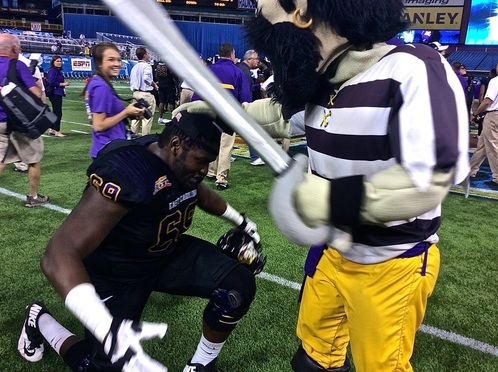 Harris has overcome early career injury issues to become a fixture at left tackle. Other than Boyd and Harris, there are four additional linemen who have ten or more career starts. Chief among them is guard Quincy McKinney, who many believe has all-conference potential. As of now, the quarterback battle is still unresolved, at least as far as I can tell through my extensive googling capabilities of every permutation of the term “ECU quarterback battle”. Sophomore Kurt Benkert seems like the frontrunner at this point though. He served as Carden’s backup last year, and has been widely praised so far this offseason. Either way, the ECU quarterback shouldn’t have to do too much except throw catchable balls for his team and not the other. His receiving corps will be among the strongest in the conference yet again. Isaiah Jones managed 852 receiving yards even with two other 1,000-yard receivers on the team last year, which is even more impressive considering one of those guys was actually only six yards away from 1,500 yards. Another guy to keep an eye on is true freshman Deandre Farrior. Many people consider him to be a strong freshman of the year candidate, and potentially a top-flight receiver for the next three to four years. Running the football may be an afterthought for this offense, but that doesn’t mean there aren’t capable runners. Chris Hairston, Anthony Scott, and Marquez Grayson all made the most of their carries last season, and there is nothing to indicate they won’t do so again in 2015. Hairston and Grayson both went for over six yards per carry and the trio combined for 10 touchdowns to only one lost fumble. 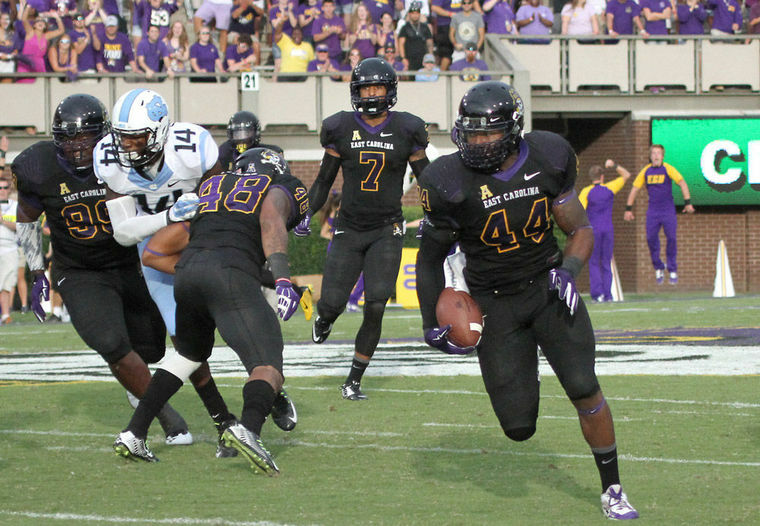 ECU’s run defense will rely on a pair of studs at linebacker to ease the transition of several new starters along the line. Zeek Bigger (2015 AAC Most Creative Name Award Nominee) had over 100 tackles last year and two interceptions with four more passes broken up. The other backer, Montrese Overton, seemed to always end up in opposing teams’ backfields. Overton had 11.5 tackles for loss and three sacks. Up front, even though there are plenty of new faces, the return of one familiar face has to be a welcome sight. As a matter of fact, just seeing Terrell Stanly still alive is a great sight. Stanley was in a serious car accident in February of 2014, after losing control of his car on an icy road. He suffered a collapsed lung, broken ribs and internal injuries to his liver and kidney. Stanley’s presence should have a major impact both on the field and in the locker room, and I think it’s safe to say that you don’t have to be an ECU football fan to pull for this guy going forward. The predictions you’ll find for this team are all of the map. That is pretty much par for the course for a team with a tough schedule and a lot of unknowns on the depth chart, but I expect this team to at least be decent again in 2015. A 6-6 record will disappoint some fans, but being a youthful team with Florida, Virginia Tech, and BYU on the non-conference schedule isn’t easy. They will probably need to win at least one of those games to have any chance to win eight games. Going to Navy and UCF will also be tough, and even though Cincinnati and Temple come to Greenville those games are nowhere near what you would call a “gimme” win.